Meet Doris Munkus! Doris has facilitated several trips. 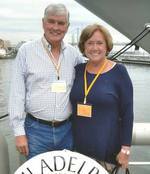 She is active at Cropwell Baptist Church and wants to connect seniors with each other across the county! Doris always hosts a fun, Christian experience on her trips. 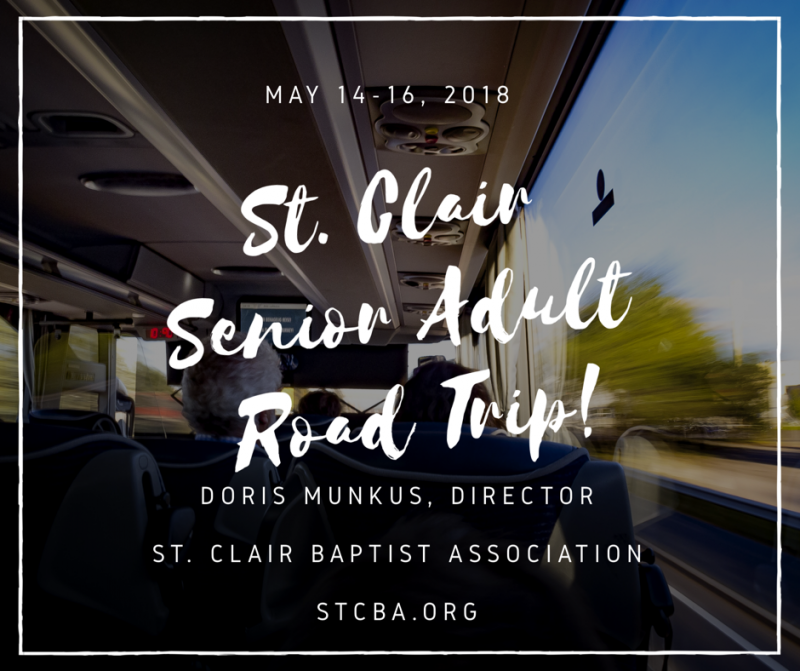 We are thankful to have Doris leading the St. Clair Baptist Association Senior Adults! *The SunDial Revolving Restaurant, Atlanta, Ga.
$235.00per person based on double occupancy. $100 deposit due upon signing. Remaining due April 14. Monday, May 14- 8:02am Depart Cropwell Baptist back parking lot. 11:32am- Arrive at The SunDial Restaurant Lunch on your own. Tuesday, May 15- Enjoy your breakfast at The Hampton Inn. 9:02am- Depart for Ft. Benning for a guided tour of The National Infantry Museum, 3 stories &190,000 sq ft. Lunch on your own in the cafeteria. There will be young soldiers throughout the museum going through training while we are there. They are most appreciative of us taking their photos. They love to talk with the visitors. Feel Free to visit with them! 2:02pm- Depart for a guided tour of Ft. Benning. 3:32pm- Depart for our Hampton Inn in LaGrange. Dinner on your own. Wednesday, May 16-Enjoy your breakfast at The Hampton Inn. 9:02am- Depart for a delightful re-creation of Israel. We will have lunch Israel style at the Bible History Center. After our tour & lunch we will depart for Pell City. We will be traveling with Birmingham Charter Services equipped with a restroom, Wi-Fi. We will be having daily devotions, singing, playing games (Name That Tune, The Price is Right, BINGO, Outburst, Heads Up, etc. while traveling. Make Checks. 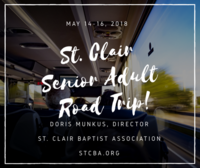 Payable to St. Clair Baptist Association. You may, also, pay with your credit card at stcba.org. Call Linda at 205.594.5173 or Doris at 205.473.4063.